Digital experience (DX) is how organizations interact with their customers, employees or partners across a variety of digital touchpoints — everything from mobile devices, desktops, tablets and wearables, to internet-connected vehicles, digital billboards and more. This can be browsing a website, interacting on social media, through virtual reality, AI or home devices (IoT). Customers are driving the digital transformation with expectations for real-time, consistent, seamless experiences. They want relevant content when and where they choose, through all their internet-enabled devices. Organizations that meet rising expectations for digital engagement can maximize the potential to drive business and increase brand loyalty. If you want to deliver a seamless digital experience, you’ll need a digital experience platform (DXP). Gartner defines a DXP as an integrated set of technologies, based on a common platform, that provides a broad range of audiences with consistent, secure and personalized access to information and applications across many digital touchpoints.¹ Organizations use DXPs to digitize business operations and aggregate content from various sources into a unified user experience. An effective DXP combines a range of tools to provide customized, relevant and consistent experiences to any audience. Some of these capabilities include content management, personalization features, integration capabilities and APIs, analytics, navigation, business process management and more. This allows businesses to unlock the power of their data, content and applications that reside both within and outside the organization to deliver meaningful omnichannel experiences to any of their audiences. Customers reward companies that get service right. But they’re less willing to tolerate bad service. More than half of Americans have cancelled a purchase because of bad service, and 33 percent say they’ll consider switching companies after just a single instance of poor service.² A great customer-oriented digital experience is a differentiator that allows you to personalize your content, get in-depth analytics data to help you make more informed decisions, and can put you ahead of your competition. And it’s not only your customers that have these expectations. Your employees, members and partners carry those same high expectations. Intranets have the power to better engage your employees, thereby improving their productivity and performance. A study by the Chartered Institute of Marketing found that 93 percent of employees believe that implementing a good intranet directly fostered better innovation. We have an expectation of an intuitive, personalized, easy-to-use experience regardless of the reason for our digital interactions. Omnichannel delivery. Deliver the experience your customers expect by offering engaging omnichannel experiences, responsive content, targeted offers and consistent branding. Intuitive, rich content management. 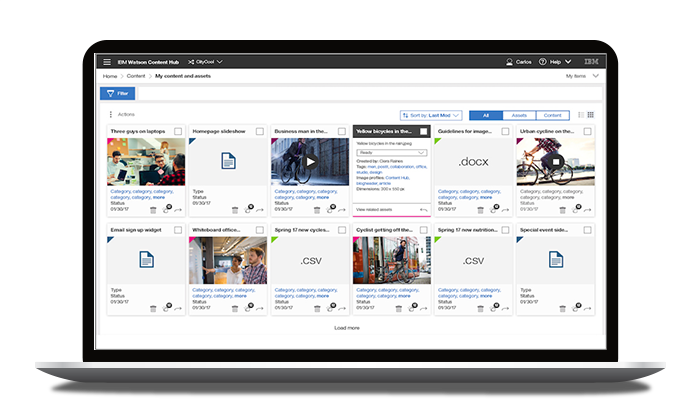 Eliminate data silos with a centralized content strategy that allows for the easy identification and selection of content that can be used across multiple environments. This helps maximize the use of your content and ensures that you can deliver the right content every time. Analytics and insights. Help identify, analyze and act on user behavior patterns to improve the experience and drive loyalty. Personalized content delivery. Identify user needs through profiling and data prediction. Regardless of channel or device, the right digital experience can then be created in real time with the right content, offer and emotional appeal. This will lead to a better, faster and more efficient customer journey. Highly scalable. Make the most of new technology and the ability to handle more users and their digital interactions without reducing performance. Acquires better agility and developed solutions to support business users. Gains a portal that helped create an exceptional quality of life. Implements new customer and agent portals with the IBM Customer Experience solution. Ensures employees and auditors have fast access to targeted, compliant information through a portal organized the way each user group consumes content. Learn more about IBM as a leader in digital experience software. IDC undertook a ROI study to assess the economic impact of utilizing DX software to create engaging, relevant experiences. Find product news, tips and best practices, and upcoming events for Digital Experience solutions in this bi-monthly newsletter. Customize digital experiences with personalized, targeted content that connects with customers, coworkers and business partners in the most powerful and productive way. 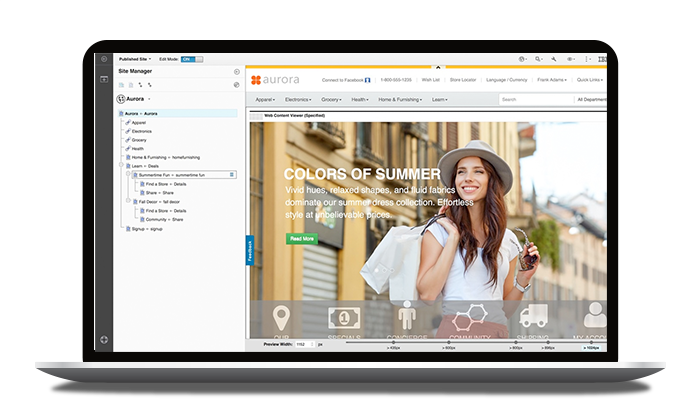 Achieve an iconic brand experience across all digital touch points with this cloud-based content management system. What can a digital experience solution do for your business?